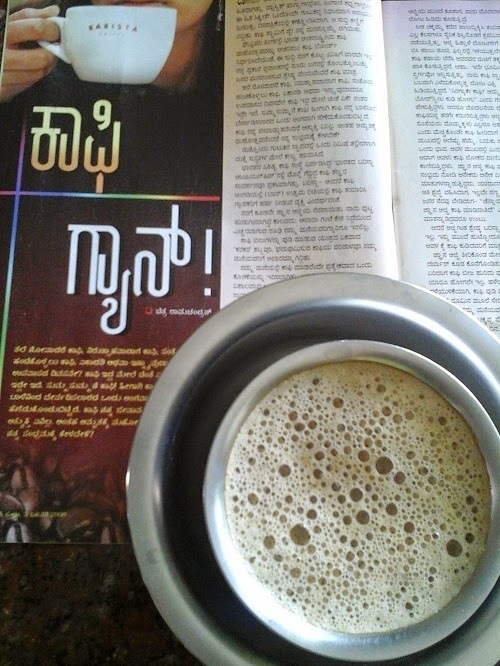 Tanjaavoor Kallichottu Kaapi - Tanjore style thick and strong coffee. Kallichottu' in Tamil means a drop of thick and milky sap of the cactus plant . 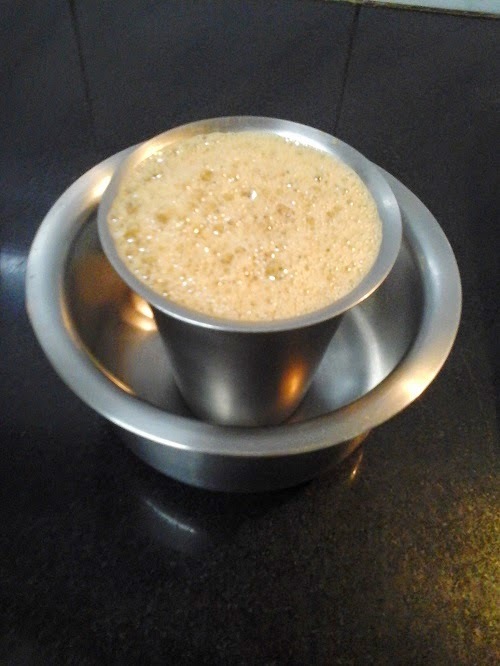 A cup of thick coffee (similar to the thickness of Kallichottu ) prepared with a dash of strong filter coffee and a glass of freshly boiled cow's milk is thus termed as 'Kallichottu Kaapi' or Degree kaapi. We enjoyed this exotic coffee in all 'Kaapi clubs' in Tanjaavoor district during our tour in South India. 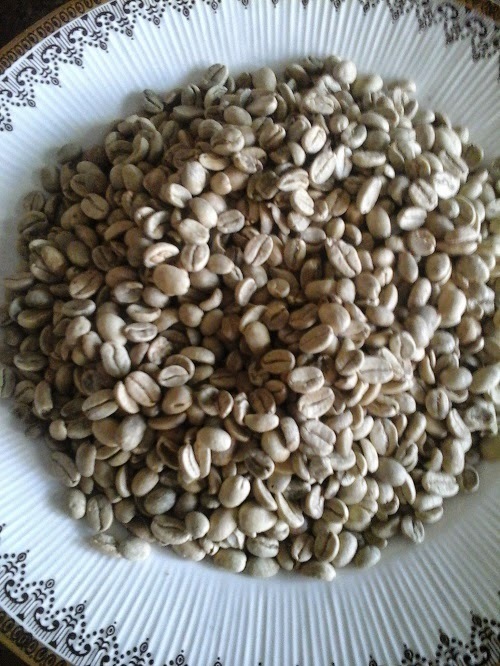 When our neighbor who is a coffee planter gifted us with a bag of coffee beans I decided to roast and grind coffee powder as my grandmother did years ago. 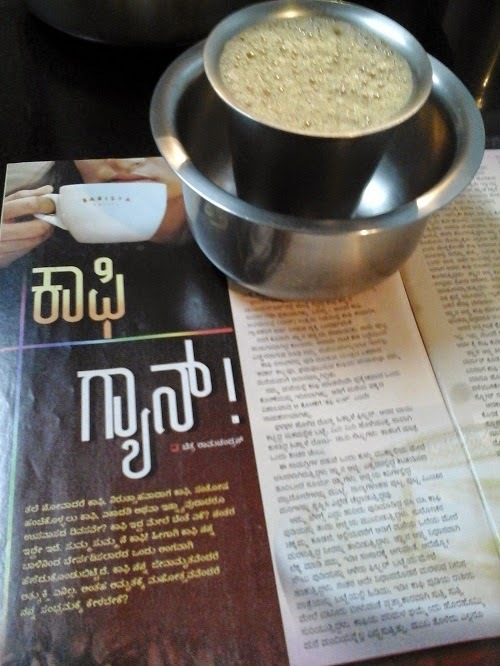 The next day as I enjoyed the exotic flavour of the filter coffee prepared using the fresh powder, I remembered that I had not done a post on my favourite Filter Coffee after all these years of blogging ! 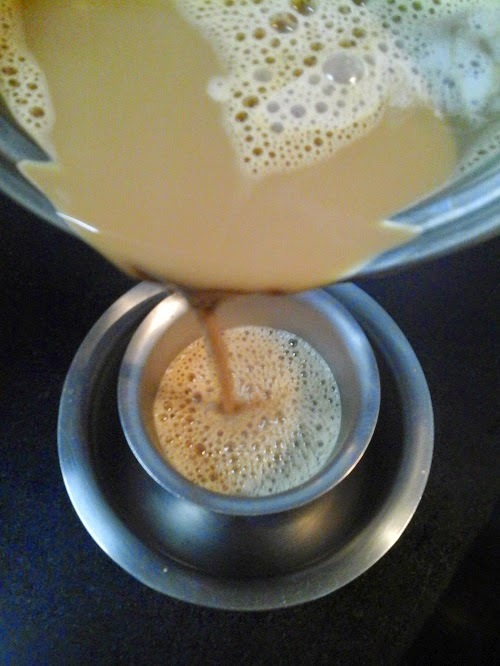 So here is a post on how I prepared the Tanjaavoor Kallichottu Kaapi / Degree kaapi for my family stating from scratch. 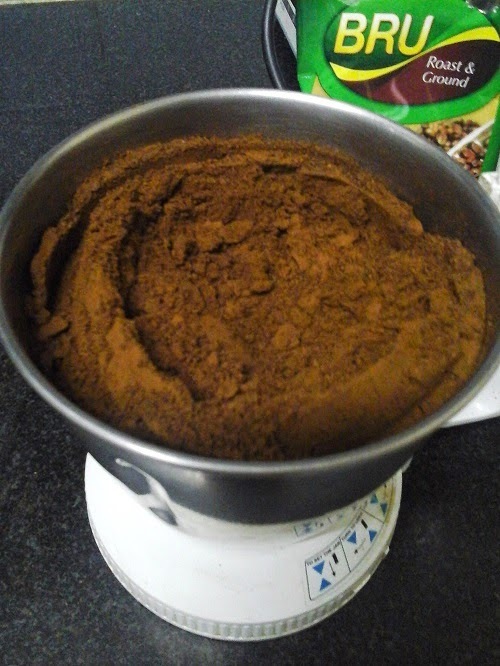 To make the coffee powder I used a blend of 1kg of coffee beans and 100 gms of BRU Roast and Ground Green Label filter coffee powder. This adds to the strength and flavour of the blend. Start roasting the coffee beans in a heavy bottomed kadai on high flame stirring continuously. 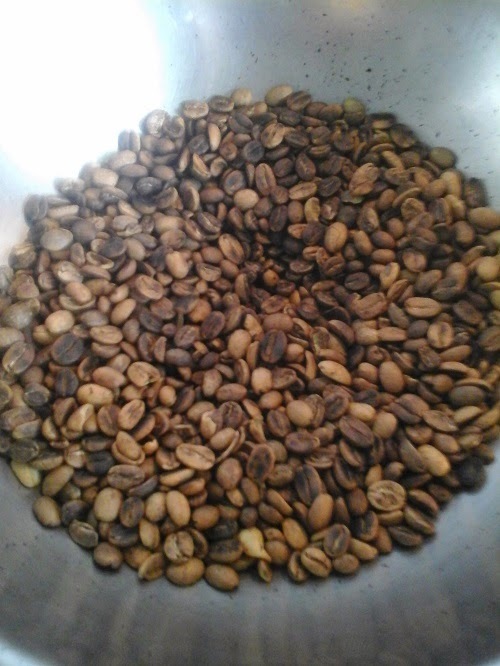 When it starts to change colour reduce flame and keep roasting and stirring continuously. 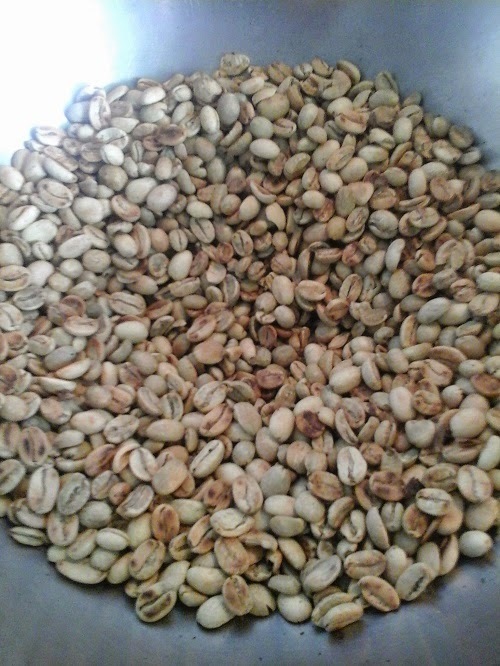 At this stage the seeds will start cracking emitting a very pleasant aroma. 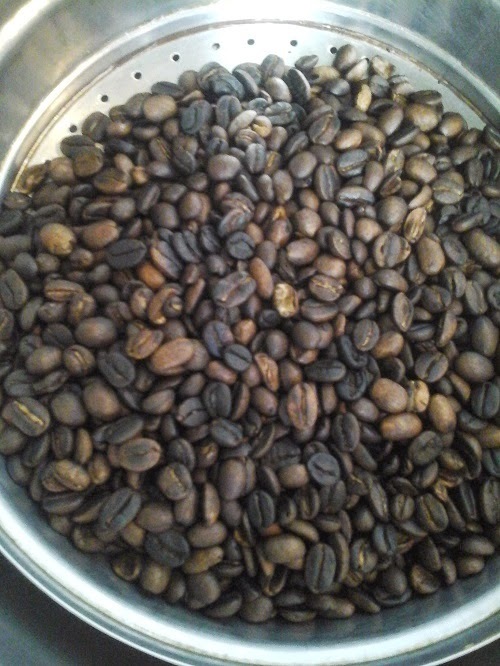 Keep roasting and stirring. When the seeds turn dark brown in colour switch off flame and pour the beans into a colander and shake well. This will prevent the seeds from roasting more in its own heat, and the burnt husk also gets separated. Spread the seeds in a large plate and allow to cool. When the seeds are thoroughly cooled allow them to sit in an airtight box overnight. 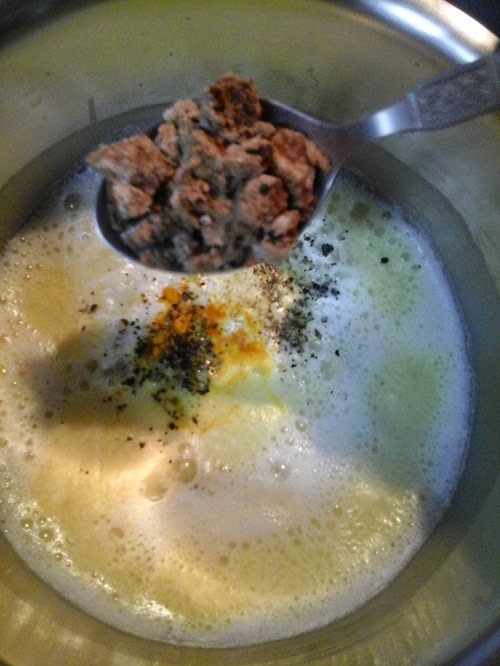 Grind the roasted seeds into a coarse powder on the next day. 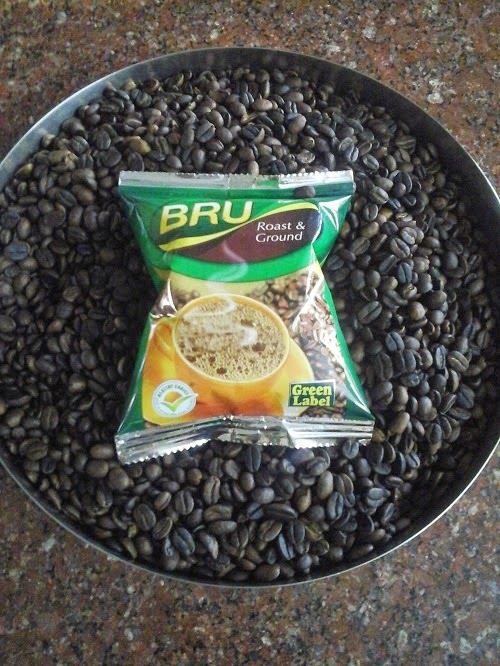 Blend the BRU Roast and Ground Green Label filter coffee powder together with the freshly ground powder. Store in an airtight container to keep the aroma intact. Wash and dry the coffee filter. Spread 4 tablespoons of coffee powder evenly inside the filter. 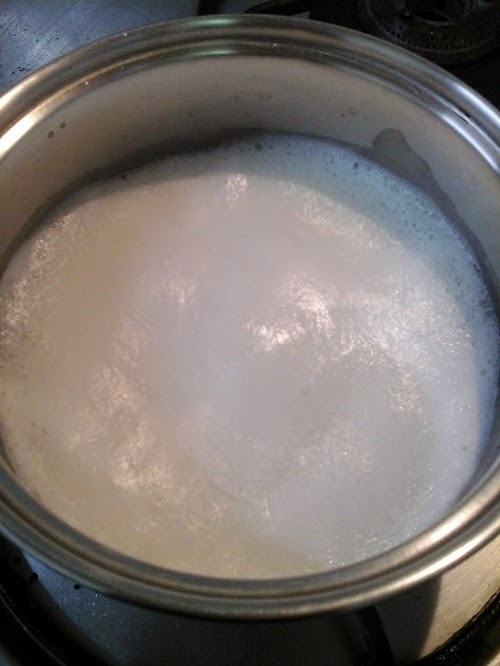 Bring water to a boil and pour it gently around the coffee powder till the powder is covered evenly ( about 3/4 cup of boiling water is sufficient) and cover with the lid. 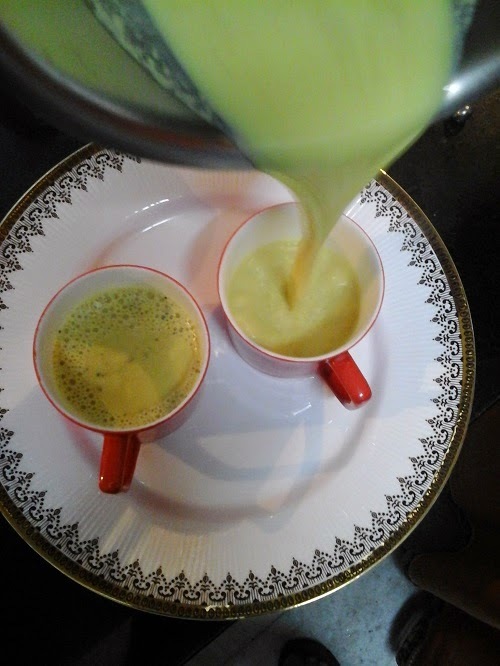 Boil one tumbler/ lota ( 2 cups ) of fresh organic cow's milk in a small saucepan. 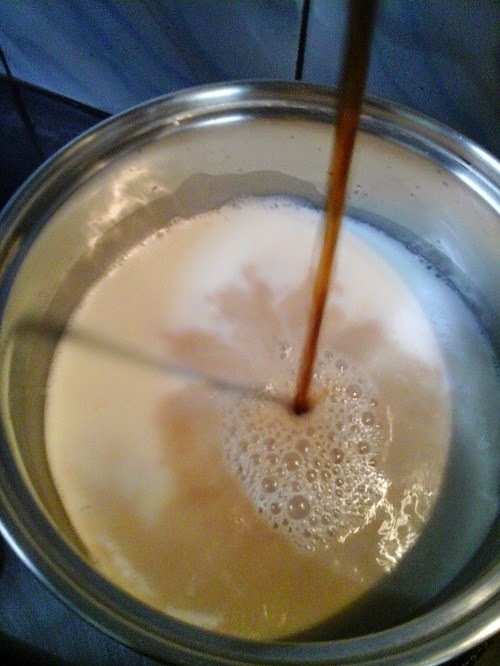 Reduce flame and pour the fresh decoction from the filter into the milk until the coffee turns golden brown in colour. Switch off flame and pour the coffee into an ever silver tumbler/ lota in a slow and steady stream to make a foam on top. 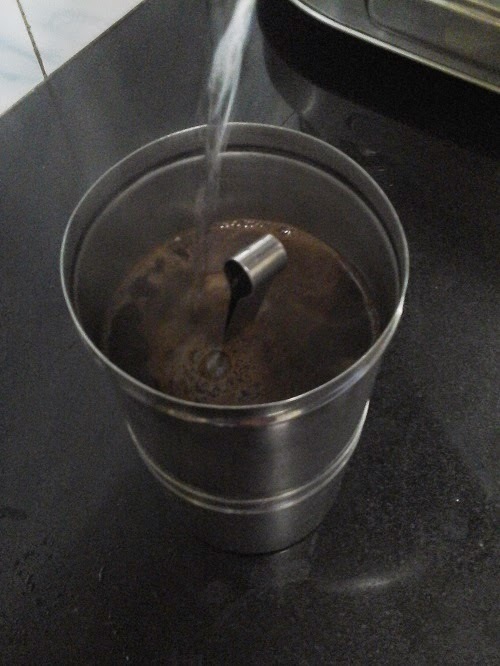 Your tumbler / lota of hot and strong Kallichottu Kaapi / Degree Kaapi is ready! My family prefers coffee without sugar.You can stir in sugar to taste if needed. 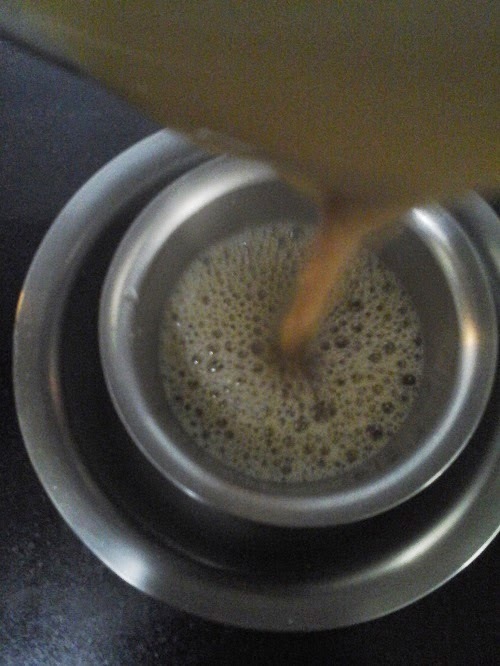 Freshly boiled cow's milk combined with freshly filtered coffee gives the best 'Degree Kaapi' ever. Here, I have shared my 'Coffee Gyaan' with you! Enjoy the fresh aroma of coffee and sip the freshly prepared Tanjavoor Kallichottu Kaapi / Degree Kaapi at leisure! The baby is sleepless with a severe nose block and cold. I run to my kitchen cupboard ! My daughter is coughing incessantly and her throat is dry. I run to my kitchen cupboard ! My sister suffers because her sinuses are congested. I run to my kitchen cupboard ! I get a dull and persistent head ache as I have a head cold. I run to my kitchen cupboard ! Some one said that God created the solution first , and then the problem ! This must be very true. Because I know that the 'SOLUTION' for all the above stated maladies that lies in my kitchen cupboard had been created and had been in use since time immemorial, much before pollution became the world's foremost problem, much much before the deluge of allergies and other infections started pouring in. The 'SOLUTION' ! It is the simple but most effective Indian spice which is in every day use in all Indian homes! The Wonder Spice Turmeric, is a 'any time ready at hand' spice.It has wonderful anti inflammatory, anti bacterial and antibiotic properties. Turmeric can be used fresh, dried and in powdered form. 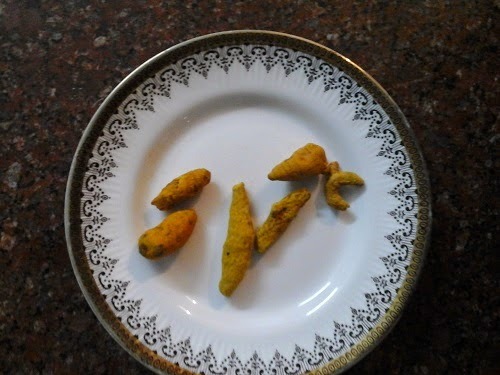 Dried whole turmeric is always stored in Indian homes and is used in Poojas and religious rituals. They are given with vermilion, betel leaves, coconut and flowers as a symbol of auspiciousness to all the ladies on special occasions. 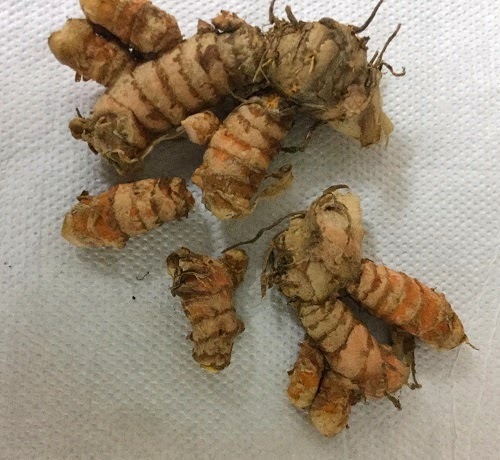 Traditionally dry turmeric is stored in the medicine chest of new born babies. When the baby is rendered sleepless due to cold and stuffy nose a piece of dry turmeric comes in very handy. It is dipped in milk ( mother's milk is recommended for new born babies ) and rubbed on the stone to get a thick turmeric paste . 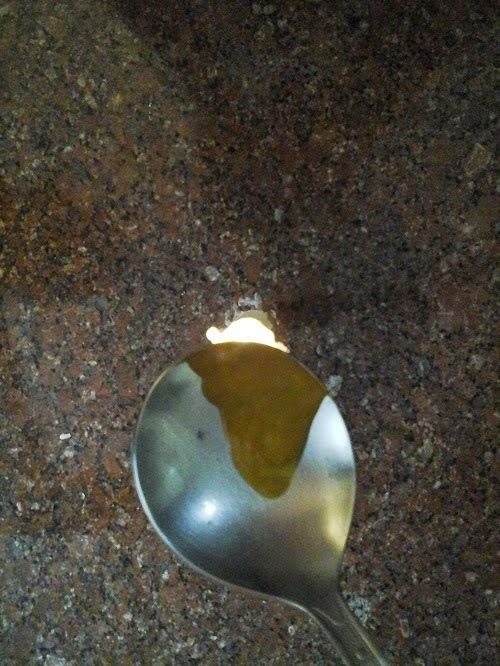 The turmeric paste is then collected in a clean spoon and is held on the flame of a candle or an oil lamp.When the paste starts to bubble it is removed from the flame. 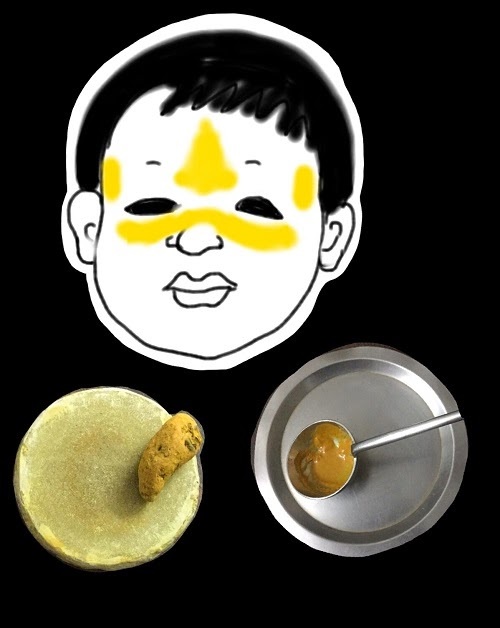 The warm paste ( NOT SCALDING HOT ) is applied on both the temples, on the forehead, and on either sides of the bridge of the nose of the baby as shown in the picture. 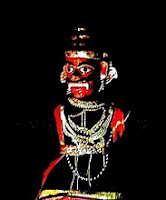 This is called as Manjal Patthu. Grannys said that this treatment assured good sleep for the babies since "the (neer ) mucous would be absorbed by the patthu". Turmeric used with black pepper and palm jaggery is a great relief for hoarse coughs and it soothes the itching throat. This milk called as Manjal Milagu Paal, is relished for its delicious taste as well. A glass of this milk before going to bed assures one of undisturbed sleep. Home ground turmeric powder or any good brand of turmeric powder is ideal for the purpose. When it starts to boil add 1/4 tsp of freshly crushed pepper, 1/4 tsp of turmeric powder and switch off flame immediately. Add powdered palm jaggery to taste and savour the Manjal Milagu Paal while hot. Palm jaggery (Panam Vellam) and palm candy (Panam Kalkandu) have medicinal properties and are very effective in alleviating cold and cough. A piece of Palm candy can be used like a throat lozenge for throat irritation. When the sinuses are infected and congested the fumes of a dry turmeric ( Kombu Manjal/ Virali Manjal - the long variety ) proves beneficial. 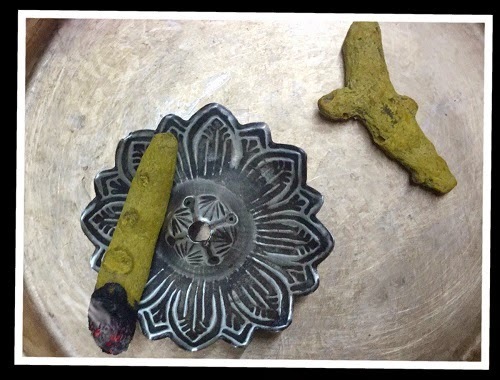 A long piece of dry turmeric is held on the flame of a candle with the help of a pair of tongs. When the turmeric gets ignited it starts fuming. Inhaling the turmeric fumes eases out the congestion and it clears the nasal passage enabling one to breathe easily. My doctor always recommends steam inhalation with turmeric powder as a quick relief for a blocked nasal passage and a dull and heavy ache in the head. A trough of water is brought to a rolling boil. 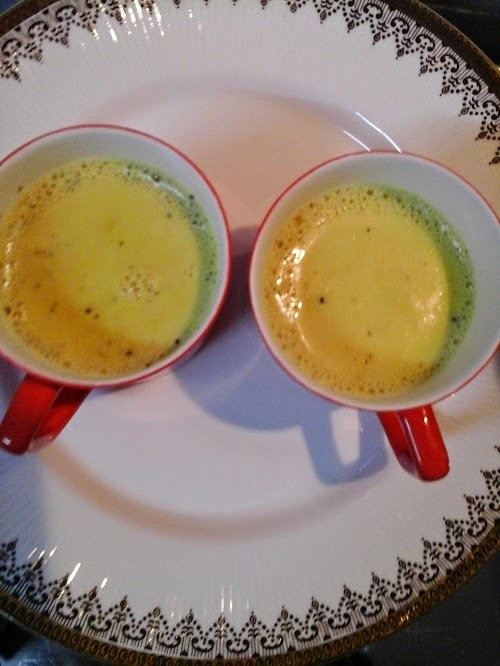 A teaspoon of turmeric powder is added to it. 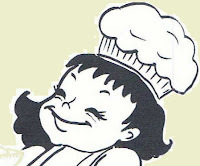 Then the steam is inhaled until it lasts. When my children suffered chickenpox my kindly doctor advised me to administer a ground mixture of turmeric and neem leaves which was rolled into marble size balls / pills. These 'pills' were administered two to three times a day and it helped in soothing the inflammation inside the body. Coming to the culinary uses good old Turmeric can be termed the king of the Indian spice box. It is a great preservative and hence is an indispensable ingredient in all pickles. Turmeric is used in powdered form in all pickles. 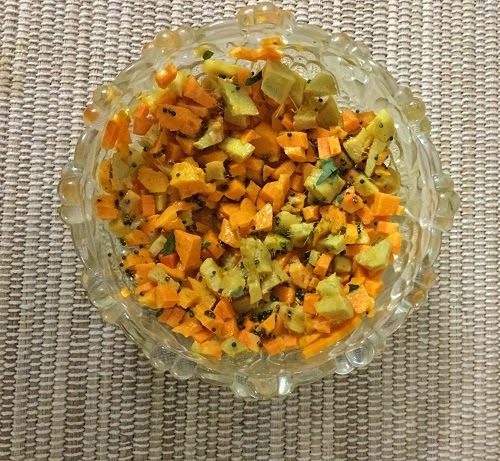 But here is an exciting way to make a pickle using Fresh Turmeric during the season. 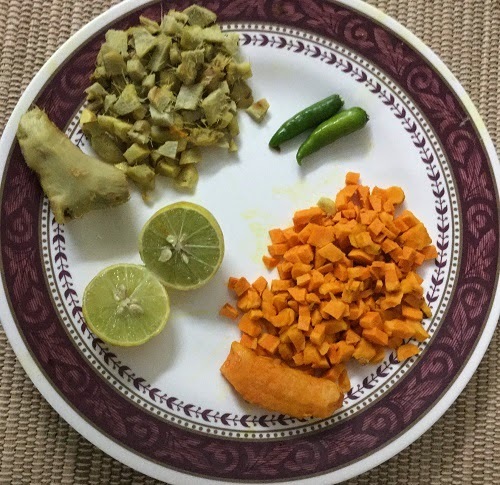 This pickle is good for digestion and it also heals the stomach. Mango ginger ( a ginger with mango flavour ) is usually used in this pickle. But normal ginger also tastes good. Mix together the chopped turmeric, ginger , salt and lime juice in a bowl. Heat oil , splutter mustard seeds ( add green chillies if needed ) and add the seasoning to the pickle. Enjoy the flavoursome and crunchy Inji Manjal Pisiral with your meal. Turmeric is also a wonderful beauty aid. 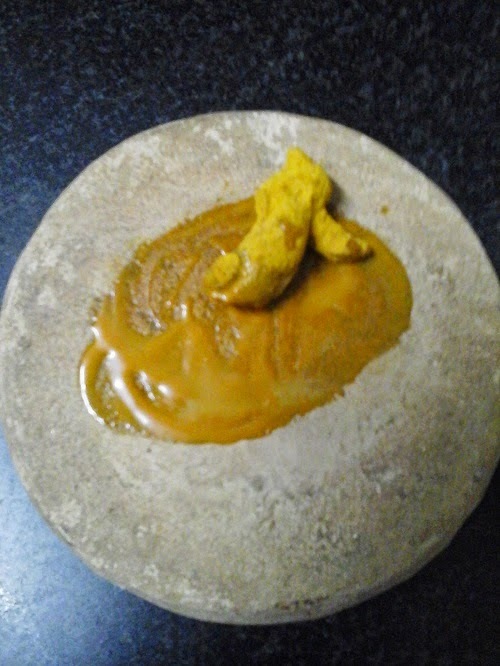 An application of Turmeric paste before bath destroys bacteria and keeps the skin clean and glowing. A turmeric face pack gives a soft and golden glow to the face. A variety of Turmeric called Kasturi Manjal is used in preparing a herbal bath powder. THANKS TO MY DEAR SISTER YOSEE ( VIDYA MURALI ) FOR ALL THE PICTURES AND THE ILLUSTRATION IN THIS POST.